Jeongdongjin in Gangneung is a popular place to watch the sun rising over the ocean. 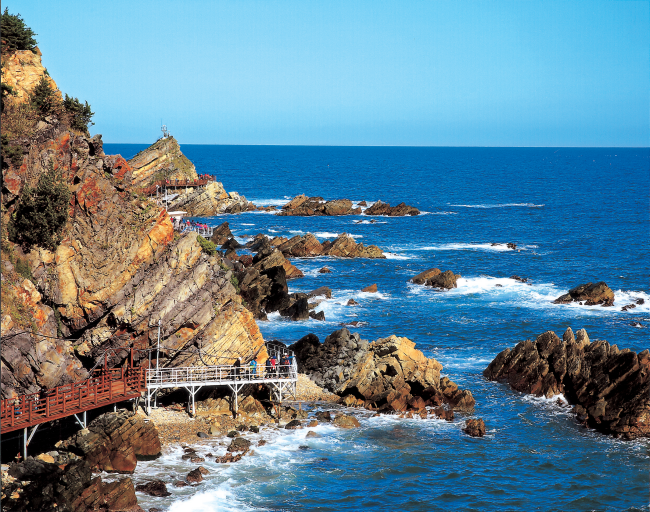 To further facilitate tourists, the city has opened Jeongdong-simgok Badabuchae-gil Trail, a 2.86km-long walking path along the rocky shore between Jeongdong and Simgok harbors. The rocks appear in the shape of a wide-open fan (buchae in Korean) facing out into the ocean. Jeongdong-simgok Badabuchae-gil Trail was previously a patrol route for the military, and has never before been opened to the general public. Take advantage of this special opportunity to explore the East Sea’s natural history through coastal terraces formed over 23 million years ago. These unique fan-shaped rocks are protected as Natural Monument No. 437. If you require help in Korea, dial 1330 for assistance. They can speak 4 languages such as Korean, English, Japanese and Chinese. This article is brought to you by Korea Tourism Organisation Singapore.